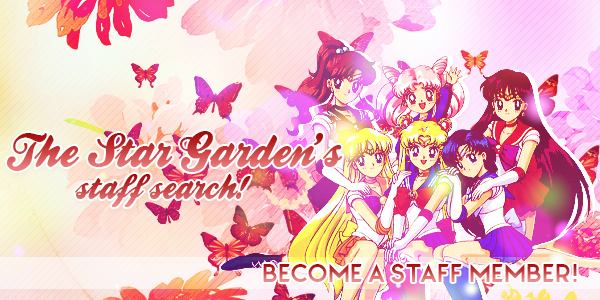 As a new sailor moon fan forum, we are looking for staff members! The list of staff needed and their jobs are below the form! How to apply: fill out this form and PM it to neo queen serenity. You will be accepted or denied your position in less than a week. Which senshi are you applying as? Do you agree to log in at least twice a week? Do you have past admin experience? Sailor Moon: the forum's founder. The leader of the inner and outer senshi. Sailor Mercury (available! ): plans, creates, and gives ideas for events. As well as other site affairs relating to planning/activities. Partnered with Sailor Jupiter. Sailor Venus (available! ): manages senshi hangouts, and the creativity society. Partnered with Sailor Mars. Sailor Jupiter (available! ): helps members, and gives them bans/warnings. Partnered with Sailor Mercury. Sailor Chibimoon (available! ): the leader of the outer senshi, is an RP admin. Sailor Pluto (available! ): approves Otaku Senshi/Canon Senshi. Sailor Uranus (available! ): creates rp events/plans rp related things. Sailor Neptune (available! ): approves storylines. Sailor Saturn (available! ): archives characters, story lines, and events. Are mods on the forum, they also help the main admin. Luna: helps the admin Sailor Moon with graphic stuff.